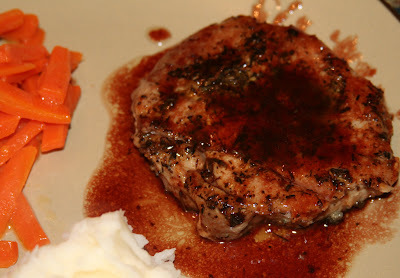 "Fork-tender herbed bonelss pork loin chops paired with a tangy raspberry sauce...heaven on a plate! This is a family favorite dish and is a perfect dish to serve to dinner guests. I always serve with mashed potatoes & julienned steamed carrots. Comfort food at its best!" 1. Preheat oven to 325 degrees. In a small bowl, combine crushed thyme, sage, salt & pepper. Rub evenly over pork chops. 2. Melt butter and olive oil in skillet. Cook pork chops for 4 to 5 minutes on each side, turning once. Remove from skillet and place on oven-proof dish. Cover with a lid or tin foil & place into oven. Bake for 45 minutes or until done. 3. De-glaze the skillet with white wine vinegar; stirring to loosen brown drippings. Add orange juice & raspberry jam. Bring to a boil, and cook for 2 to 3 minutes, or until sauce is reduced to desired consistency (sauce will thicken as it cools). Place chop on plate and drizzle with sauce. Oh WOW, that looks sooooooooooooooooo yummy!